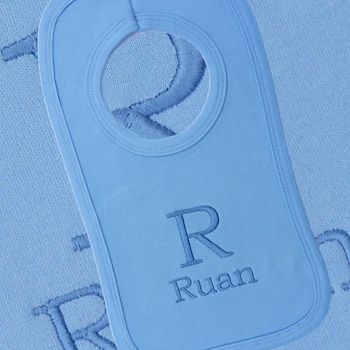 Just enter the text you want sewn and we will personalise the bib with a Large first initial and name underneath in your choice of thread colour. The bib is good quality made in the UK 100% double layer cotton pullover bib to help keep clothes dry and free from stains and is easy on and off pullover - no fiddly knots to tie. Bib colours available; White, Black, Blue, Yellow, Pink, Red. Please fill in the initial and name you would like embroidered in the boxes provided (please check spelling). Select the thread colour you want.